Anglo-Norman treatments of the Arthurian legend during the twelfth and thirteenth centuries offer strikingly varied presentations of Guenevere. Having defined how Geoffrey of Monmouth’s presentation of Arthur’s queen in the Historia Regum Britanniœ reflects his interest in the life of Empress Matilda, I then wondered whether Guenevere’s portrayals in the works of Geoffrey’s translators—Wace’s Roman de Brut and Lawman’s Brut—might likewise reflect an interest in the life of a female historical figure. 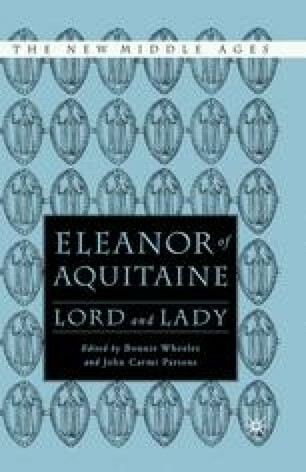 Using feminist and New Historicist methodologies, I have identified both broad patterns of connection among female characters in each translation and specific patterns of connection between Guenevere in these two texts and Eleanor of Aquitaine. The drastic shift in the portrayal of Queen Guenevere as the Arthurian legend gets transformed from Wace’s Roman de Brut into Lawman’s Brut is certainly consistent with the two poets’ respective treatments of female characters. However, given Wace’s connections with Eleanor of Aquitaine and Henry II as well as Lawman’s composition of his Brut during a period of increasingly misogynist rhetoric, Eleanor emerges as the most likely female historical figure to whom these two writers respond. Consequently, the decline in Eleanor of Aquitaines reputation in annals and chronicle histories at the turn of the thirteenth century offers the most plausible explanation of the decline in the reputation of Guenevere as Eleanor’s fictional counterpart. The drastic shift in the portrayal of Queen Guenevere as Lawman transforms Wace’s version of the Arthurian legend is most likely the result of the decline in Eleanor of Aquitaines reputation in annals and chronicle histories at the turn of the thirteenth century.